Seeing as it was father's day today, we decided to take a drive up to Loch Lomond as the weather was fair. Got a bit of a late start but we headed through Milton of Campsie, Blanefield and Drymen with our intended destination Millarochy Bay on the East side of Loch Lomond after buying a baguette, some cheese and some pâté for an al fresco picnic lunch. I had heard about the new restrictions on the East Side of Lomond and have blogged about them here before but was shocked to see this sign just as we left Drymen. 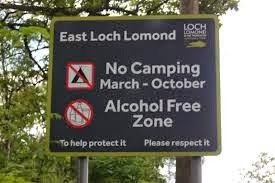 Now, had I fancied a wee glass of wine or a beer with my bread and cheese on the beach at Millarochy bay, it would appear that the Loch Lomond Park Authorities would seem to have put the Kibosh on it ! 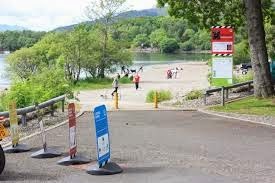 I don't know about you, but I can't think of any public beach in the world, except the one's on the East Side of Loch Lomond that you can't take a bottle of wine or beer to, to enjoy with your picnic lunch. Just as well our car was an " alcohol free zone ". So, we carried on to Millarochy bay and I must say, the quiet roads were a clear indication of what was to greet us on our arrival. Millarochy Bay was all but deserted at 2 p.m. on a summer Sunday afternoon. Just to put you in the picture, there were a few people here but the bay used to be really busy, with folk picnicking, swimming, windsurfing, kayaking, using their jet ski's and ski boats. So much so that there were days when the Police had to stop people on their way through Drymen with a " one out, one in policy ". Anyway, as there was hardly anyone here, finding a parking spot and somewhere to sit was no problem.
" Great " you might say, but a place without the right atmosphere and all but devoid of people is almost what I would call an atmosphere vacuum. So, we had our picnic lunch , in the relative peace and quiet of this formerly bustling beauty spot after which I decided to have a wee chinwag with 3 of the " Park Ranger's " and chew the fat so to speak as to what had happened here. Only to find that even to take your car with a kayak or sailboard onto the beach, past the security bollard's you have to pay a £15 launching fee these days. 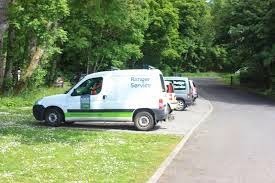 The Ranger's reckonned the decline in footfall to Millarochy Bay and the East Side of Loch Lomond these days is down to fuel prices but with only 3 cars on the beach and about ten in the car park 2 of which were Ranger's vans, I have my own views on the matter. Considering the fact that the sanitory signage, coupled with directions on what you can't do on the East Side of Loch Lomond these days, seems to be more prominent than the trees. I remember the days when Millarochy Bay was unregulated with folk having a great time and going home after a great day on the beach. Then, they built the " Ranger Station ". Then, they said no cars on the beach unless you are launching a boat or other type of watercraft such as a kayak or windsurfer. Now, you can't even get onto the beach without paying £15, coupled with the fact that you can't have a beer or a glass of wine with your picnic - Go figure ! While up at Millarochy bay today, I had to laugh when I read about Councillor Billy McAllister ( deputy leader of the SNP in Glasgow City Council ), in todays Sunday Mail, complaining about spending 12 hours in Police custody. No doubt under " Section 14 of the Criminal Procedure (Scotland) Act 1995 " which gives Police detention powers outside of their " Powers to Arrest ". Basically, if you are merely Suspected of the slightest possible offence, you can and it seems to be policy that you will be given up to 12 hrs jail time even if you have done nothing wrong. I laughed, not so much at the misfortune and no doubt unpleasant time, in the hands of the Police, of Councillor McAllister. But, more at the irony of the fact that he and his compatriot politicians meddling with our Civil Liberties beyond existing legislation, such as what is going on in Scotland at the moment, probably allowed the Police to handcuff him and put him " In the Clink " in the first place. As sure as the " Sun Shines Bright on Loch Lomond ". This should be a warning to all councillors and politicians. Mess, or allow Local Authorities to Mess with our Civil Liberties and they WILL come back to bite you on the Arse. Talk about " chickens coming home to roost " ! Respectfully have to disagree with you on the section 14. It only applies to offences punishable by imprisonment. In addition I would argue that the use of section 14 is not as wide spread as perhaps you might think. why? because in the vast majority of enquiries there is sufficiency of evidence to charge without resorting to section 14. i would also argue that detaining offenders for 4 hrs let alone 12 hrs I before either being cautioned and charged, or released is the exception. Again, in the vast majority of enquiries, gathering evidence sufficient to prefer a charge or to establish insufficient evidence to prefer a charge often takes less than a couple of hours. Mark, thanks for your comment. It would be interesting to know where you are getting your information from as Councillor Billy McAllister's ordeal at the hands of the Police seems to tell a different story. It doesn't matter whether 1 or 100,000 people are detained under section 14 of the Criminal Procedure Scotland Act 1995 without subsequent charges being made. An act which allows Police to deprive even one person of his basic right to freedom on the mere suspicion of almost any suspected crime without the opportunity to state his case first is an aberration in a free country. Jail you first and ask questions later ? What happened to innocent until proven guilty ? Checks and balances are always being reviewed where civil liberties are concerned. Recently a protocol was introduced such that when offfenders' are section 14nd right at the start of the prisoner processing protocol they have access to a solicitor for private consultation out with the hearing of the police, if they so wish. This ensures that this ensures an opportunity to review the facts surrounding the detention prior to any police questioning. What this does is firstly, ensures that the section 14 procedure is not abused as cops know that where they invoke the procedure out with the rules it will be highlighted in early course and they will be held to account. Secondly it enhances the basic human right of the alleged offender to representation prior to police questioning. Whatever happened to innocent until proven guilty? well, nothing. Section 14 does not determine whether an offender is convicted of a crime or not. That's for the courts to decide. Consequently an alleged offender in the eyes of the law will always be presumed innocent until proven guilty in a court of law. Section 14 has no bearing on that decision. Where Councillor McAllister is concerned I'm afraid I cannot and will not comment on particular case. All this being said. I really like your blog and you seem like a pretty interesting bloke to spend a days fishing with. I live nearby. was wondering if you were up for a fishing trip some where and we could put the world to rights while catching some fish. You up for it? Suspicion of " An offence punishable by imprisonment " could be deemed to be almost any offence. I thought it was only appointed Sheriff's of the Court who got to decide what was punishable by imprisonment and what was not ? Under section 14, it would appear that this is no longer the case. People fought and died for our " Freedom " in this country. Section 14, in my opinion, has made a mockery of their sacrifice. On your first point, to be honest I can't fathom your reasoning. In cases where someone is accused of serious crimes such as you have cited. I think it would be a no brainer that someone would probably be taken into custody and then charged accordingly providing there was sufficient corroborative evidence of the allegations against them. That's how it should be and I don't think section 14 would even have to be used in such instances. I'd be interested to see where you are getting your information on Police protocol re. the invocation of section 14. As I think you might find you have got your understanding of the facts back to front. As far as I understand, Police procedure is to detain people under section 14, on the mere suspicion of an offence, should they deem it so right. Then take the person/person's to a Police Station before they would then be offered a solicitor. At which point the person/s are already a " Prisoner " as you so rightly put it after having lost their " basic right of freedom " and they will then be detained in a cell for up to 12 hrs while they wait for a solicitor to arrive or while the Police carry out further enquiries in order to either bring charges against them or release them. I appreciate your comments about the blog but as far as putting the world to rights, I gave up on that one a long time ago. I sometimes make observations about things I see and read and try to channel them in the right direction though. But, Aye, who knows, it might be an idea to hook up some time. Mark, thanks for your last comment. Could you contact me at fishinginscotland@live.co.uk please. Mark Caffrey's last comment on this topic has not been published at his request.